I’m a Mina V. Esguerra fangirl. I’ve read and reviewed all of her books and even did and interview and giveaway last year. She’s my favorite Filipino chick lit writer and I keep recommending her books to my girlfriends because all of her novels are so light and fun. I knew she was planning to release Interim Goddess of Love in 2012 and I was really looking forward to it, not only because I’ll read anything she writes, but because she’s tackling a new genre. All of Mina’s other books are contemporary romance with women in their twenties as main characters. This time, she decided write a contemporary young adult novel, with a hint of Philippine mythology in it. Some girls can’t stand to be around the guy they like. They get really nervous, and rather than make fools of themselves, they just stay away. I was the opposite; the more I liked a guy, the more I wanted to be around him. I was the type who’d join the same org, or pick the same elective. Sure I was probably looking like a fool five times a day over a bunch of things, but I liked being close to someone I admired. The act of doing something about the feelings, no matter how futile the exercise, was still way better than sitting around just hoping they’d notice the girl who never said anything. Hannah has never had her own boyfriend but she’s not willing to be a wallflower either and I liked that about her. 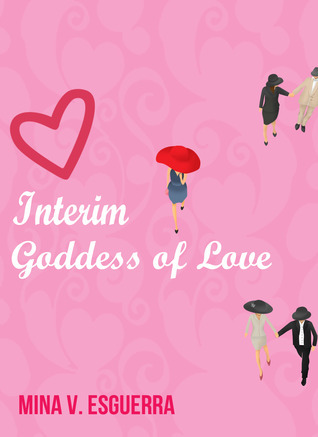 The huge cast of characters in this short work of fiction may be confusing for some people but that’s one aspect of Interim Goddess of Love that I really enjoyed. Thank you, Mina, for giving us so many swoon-worthy guys in one book! I couldn’t decide which guy I should root for. This installment is about Kathy’s romance but in the process of finding her true love, we get hints about Hannah’s possible love story as well. I think the number of characters sets up the sequels quite nicely – I’m hoping to read more about the other characters in the next books. Interim Goddess of Love is a promising introduction to Mina’s YA work and it’s just as charming and fun as her other books. After finishing this, I went online so I could bug Mina about the sequels. I can’t wait to read them and I will recommend this one to anyone interested in reading Filipino fiction because I have a feeling they’d enjoy reading Interim Goddess of Love as much as I did. Sarah, have you read any Filipino chick lit novella? There are several published by Summit Books (Mina has some books under Summit too). I read and collected those back when I was in college and I’m glad they’re being more active in publishing titles nowadays. You can start with any of Mina’s books, they’re all enjoyable. The ones that I like the most are this one, Fairy Tale Fail, and Love Your Frenemies. This book sounds like a lot of fun! I love to see mythologies incorporated into books, especially lesser-known mythologies (pretty much anything other than Greek/Roman/Norse/Egyptian, though of course I love those too). I also love books that can fit into that ‘new adult’ age group! There’s so many reads out there about high schoolers, or graduates, but not much for college students. Heidi, so glad you’re interested in reading this! I like mythologies in books too. What are some of your favorite mythology retellings? I like all kinds of mythologies, even those that are more well-known, but it is refreshing to read about a unique type of mythology. And any well-written Filipino fiction is always a plus for me. 😛 I’m also a big fan of New Adult. I want more books set during college instead of high school. I still haven’t read American Gods. I have no idea when I’ll be able to bump that up the TBR pile. I sooo want this to be on the nook soon! I’m excited for you to read it! I hope it becomes available in B&N or in Smashwords. Chris, there really was something for everyone in this one! And you can choose which guy to crush on too. 😛 I want more Filipino YA books too! I enjoyed the mythology in this one too. I did want a little more resolution for Hannah but I liked the idea of a series, which leaves a lot more room for character development. It’s a good thing I knew going in that this is part of a series. Because I knew that, I had a feeling Hannah’s story won’t be resolved maybe until the last installment. Holly, you know it makes me happy that you have become a Mina fan too. I hope you get to read one of her books soon! This sounds like a lot of fun! If you keep up with the enthusiasm, Chachic, you’ll end up turning me into a chick lit reader as well. You never know! I’ve learned with Gen that your enthusiasm can be quite contagious. Oh Maja, you don’t have to worry about that. I will always be enthusiastic about Mina’s books. It would make me happy if you’d read one of her books. Let me know if you want more chick lit recommendations! I used to think I wasn’t much a chick lit readers until I realized I just wasn’t reading the right kind of books. This one really has a kilig factor, right? I can’t wait to read the sequels. I wish they’d be released at the same time.